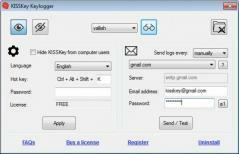 KISSKey is an intuitive keylogger that allows you to monitor keystroke activity on one or more user accounts. You can set up the program to automatically send password-protected emails containing the latest logs. It can be used to efficiently monitor employee or children activity as it has a simple and intuitive interface. The program is able to record keyboard activity in any application or web page. Besides a few basic settings you can also choose to hide the app from computer users and password protect it. You will be able to access KISSKey with a customizable hot key. Recorded keystrokes are saved to a plain text file called OUT.TXT. However, you can also set up the program to send you emails containing logs as ZIP archives which you can optionally password protect.